"As even non-Canadians may recall, there was a big issue in the country a few years back over a so-called "iPod tax" (something that cropped up again in the recent election) and, while it still hasn't come to pass, the Canadian Private Copying Collective is now pushing for a music tax of another sort. While there's no iPods in danger of being taxed this time, the CPCC is asking for a new levy to be placed on memory cards (presumably all types, although that hasn't been specified)." This makes even less sense than the CD/DVD tax does; the number of MP3 players that use memory cards is relatively tiny, though they're probably targeting phones more than anything else. Thankfully I don't go through that many blank CDs or DVDs any more, but the concept of this tax is inherently unfair. 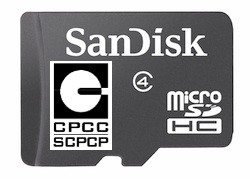 I'd guess that the vast majority of memory cards purchased are used in digital cameras, so how can the CPCC justify their charge of copyright violation? This is bureaucratic corruption, pure and simple. Talk about barking up the wrong tree. I think most music is on iPods, which as we all know, have no memory card slots. If they want to tax, they might as well tax music players. If they're going to do that, legalise all forms of music downloads, otherwise this is just a money grab. They should tax paper since you might use it to print or 'copy' something copyrighted (copyrighten?) And pens and pencils too. Maybe tax eye-glasses because you might see copyrighten material. This is kindergarten mentality, punish or withhold from the whole group because what one or two might do. To bad the electorate doesn't remeber this sort of idiocy when elections come around. None (0) should be re-elected because of what some have done.